I'm building a couple of prototypes for a page that needs to display around 2000 items in a grid of 3 items with 600+ rows. What we're looking to achieve is a quick page load time, but also no hassle while scrolling. The case I'm investigating is a little out of the ordinary, in the sense that I assume that I already have the large object in memory. It's not like a more normal case where I send out paged AJAX calls to some REST server. So, I've created a couple of AngularJS prototypes, which I've analysed with the Chrome Dev tools - the TimeLine tool to be exact. Here are some of my results. You get this by opening up dev tools, going to TimeLine - hitting record and reloading the page. After clicking stop - you see this awesome graphical representation of the page load events + nested function calls ( flames ). 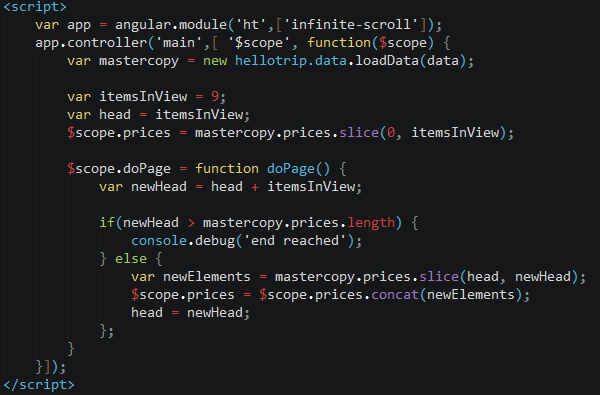 The DOMContentLoaded event fires and the AngularJS controller needs 200ms to render everything. Note the green line under the flame chart that shows the number of nodes in the DOM. Then I got an infinite scroll module for AngularJS which I applied. OnLoad I load 9 elements into the scope variable and every time the page event fires, I add another 9. However, I'm not sure this will give a nice scrolling experience to the user, especially on tablets. That's why I moved to option 3. In this prototype, I load enough items to fill up the screen and return from the controller contstructor. Then after a timeout ( 100ms ), I append the rest of the data. As you can see - a 30ms flame ( so as fast as the infinite scroll solution ) which loads 9 items into the viewmodel and handles the binding. Then after 100ms, I append the rest of the items ( approx 150 ms ). In the browser you see the DOM being built op very quickly and do not notice the rest of the items being loaded. The only thing you can see is the scrollbar jump up after 100ms, when the rest of the items are bound to the viewmodel and generated as HTML. Right now - the last approach seems the most promising: very quick page load time and 'normal' scroll behavior.